The following review assumes that the reader has read Star of the Morning and The Mage's Daughter, the first two books in the Nine Kingdoms trilogy, and does contain spoilers for those books. Evil has been slowly seeping from the well Gair had opened years before. Miach could not close the lid on his own, he needed to learn what spell Gair had used. This is where the final story of the trilogy begins. Miach and Morgan have been traveling with Morgan's grandfather, uncle and one of Miach's brothers. Their purpose is for Miach to study various magic to find the spell they need. During this quest, they encounter new foes, and as always, they rely on one another to overcome those obstacles. However, they are also surprised by unexpected allies. It is a journey that taxes them mentally and physically. They rely on their sword, and, much to Morgan's continual chagrin, magic. The well is not the only challenge they face. Lothar still threatens the Nine Kingdoms. Miach still manages his spells of protection, but he fears that their enemy is attacking on a new unknown front. Regardless of the obstacles, the love that Miach and Morgan have for one another remains constant and true. 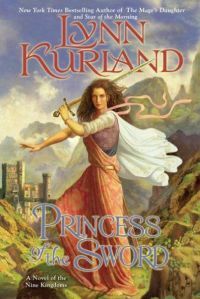 Princess of the Sword is the final story in Lynn Kurland's Nine Kingdoms trilogy. Although Miach and Morgan had already pledged their love for one another in the previous story, that didn't diminish the romance between them. This story showed the continual growth of their love, as well as some of the growing pains in a new relationship. Although Miach might want to keep Morgan out of harms way, she is a warrior in her own right, and he loves her all the more for that. I certainly hope that Ms. Kurland decides to write another epic romance, as this was an absolutely amazing trilogy.